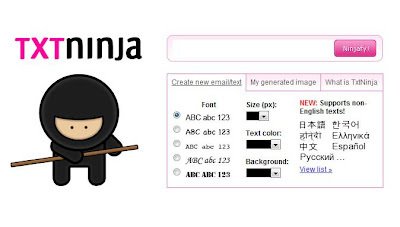 TxtNinja is a simple tool that lets you convert any text into picture. For what? there are several possible reason you want to do this. For example, masking your email, displaying non-English characters, bypassing text filters, escaping spam bots and many more to mention. Aside from conversion feature, TxtNinja allows you to customize the font type, color, size and background color of the text when it is converted into an image.